Stacey Abrams continues to challenge the legitimacy of the 2018 gubernatorial election in Georgia. Despite losing the race to Republican Brian Kemp by 54,723 votes, Abrams has repeatedly refused to concede the outcome. The failed candidate reiterated her attacks on the electoral system Wednesday at the National Action Network's annual convention in New York City. When it came to questioning the legitimacy of what she described as a "stolen election," Abrams did not hold back. "Despite the final tally and the inauguration [of Brian Kemp] and the situation we find ourselves in, I do have a very affirmative statement to make: We won," she told the crowd to raucous applause. "I refused to concede because, here's the thing: concession needs to say something is right and true and proper. … You can’t trick me into saying it was right." 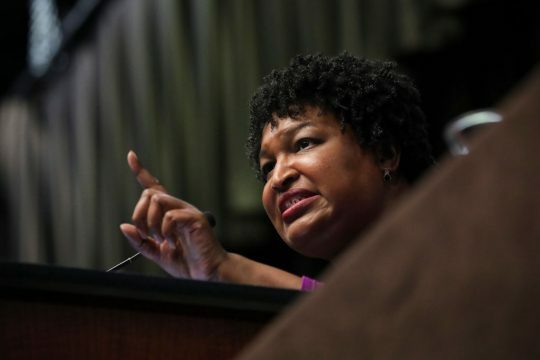 Abrams went on to suggest that she would never accept the results of the election because Republicans "stole it from the voters of Georgia," rendering the outcome illegitimate. "Concession needs to say something is right and true and proper," she said. "You can't trick me into saying it was right." For some reason, Abrams has been spared the media hysteria, and outrage from members of her own party, that accompanied then-candidate Donald Trump's equivocating on whether or not he would accept the results of the election if Hillary Clinton won. Abrams and many others denounced Trump for refusing to accept defeat prior to the election, which he went on to win. Members of the media and Democratic politicians argued that by leaving the door open to challenging the legitimacy of the election's outcome, Trump was attacking democracy itself, and threatening the "national stability" of the United States. Abrams is reportedly considering a run for president in 2020, and her inner circle is said to be fuming about the media's adoring coverage of Beto O'Rourke, a relatively obscure white politician whose most recent accomplishment is also failing to win a statewide election. It is rumored that Vice President Joe Biden, who appears likely to announce his candidacy for president in the coming weeks, has reached out to Abrams and asked her to be his running mate, a move that one Abrams aide recently dismissed as "exploitative." This entry was posted in Politics and tagged 2018 Election, 2020 Election, Democratic Party, Donald Trump, Georgia, Stacey Abrams. Bookmark the permalink.